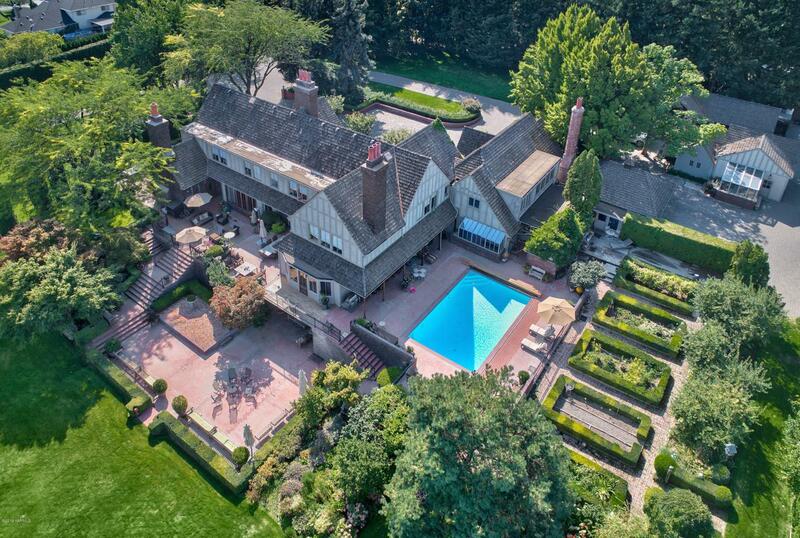 Nestled inside garden walls sits this stately Tudor rooted firmly atop Yakima's coveted Scenic Hill. The property, comprised principally of garden spaces and sprawling lawn, is refined and thoughtfully designed. Contained within three levels, the shy 14,000 square feet inside the home offers handsome entertaining areas matched by private wood-wrapped rooms. To the rear, the home opens from multiple points onto an expansive multi-tiered brick terrace, offering outdoor experiences unique to each room. The kitchen and adjacent sitting room open onto the pool terrace, lined by courtyard and garden space.The main hall and dining room open east to the largest upper level terrace area, which overlooks the property grounds and private pond. The adjoined atrium, one of the homes two greenhouse spaces, offers garden-like tranquility year round. Upstairs find the primary private spaces, warmed by natural light through large windows and rich molding detail. Down the wide stairwell to the lower-level, find secondary areas perfectly fit for informal entertaining. Finely finished in keeping with the homes detail, find a large recreation or secondary living room complete with a full-sized wood and brass bar, a wine cellar and climate controlled wine room, additional guest quarters, abundant storage spaces, and large craft room or office. In Brief... 13, 918 Richly appointed square feet 3.84 Sprawling acres Private brook-fed pond with dock and boat house 7 Bedrooms 8 Bathrooms Wine cellar & wine room. In-ground pool Sizable guest or carriage house 2 Greenhouses Multi-Tiered Terrace Regal sized master suite with marble en suite, sitting room, & fireplace. Leaded and stained glass detailing Gated drive with cobblestone driveway A bit more... the home offers a well-sized library with full bar just off the main hall. The heart of the home, a country chef's kitchen with large center island and commercial appliances, (complete with large butler-like pantry & informal sitting room) provides a warm welcome to friends and family alike. The greeting room and main hall are commanding. Accented with crystal chandeliers and a marble fireplace. Both the formal dining room and hall open to the terrace. The lower-level living areas are finely finished offering expansive space for casual entertaining, also home to a wine cellar & wine room, as well as massive store rooms. Two staircases lead to the upper level, one stairwell serves as secondary private access to the master suite. Listing provided courtesy of Sarah Lund Snyder of Berkshire Hathaway Homeservices Central Washington Real Estate.